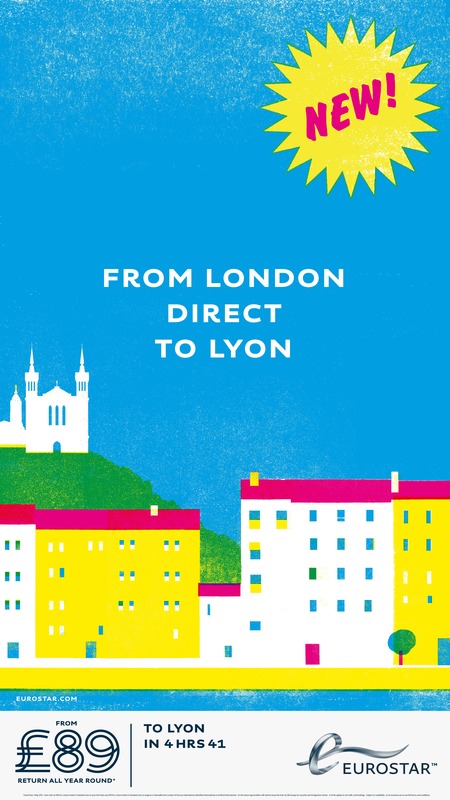 Eurostar today launches a new advertising campaign to promote its year-round service direct to Lyon and the South of France. 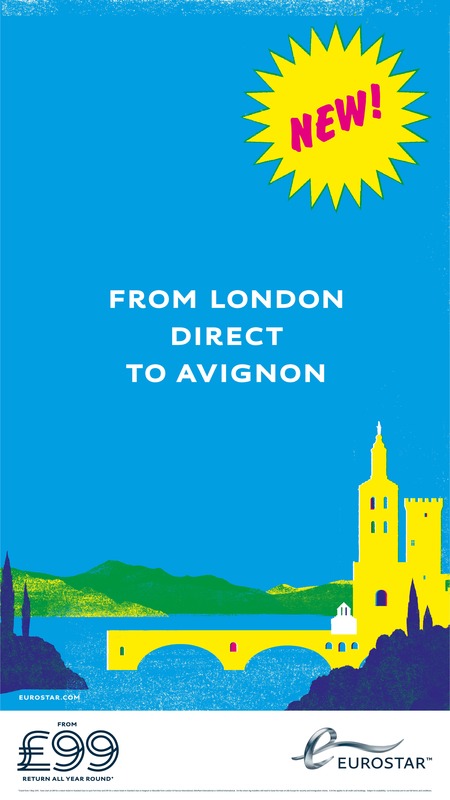 Targeting the leisure market, the creative focuses on the warmth and sunshine of the popular French destinations of Lyon, Avignon and Marseille which will all be within easy reach of London thanks to the new Eurostar service starting on 1st May. The campaign will appear across digital media (since 2nd February) as well as London underground and buses from the 2nd March. Celebrating the variety of landscapes that can be enjoyed with train travel to the South of France, four different visuals have been developed for the UK campaign by French agency ‘Gabriel’. The visuals take inspiration from the ‘PLM posters’ (Paris-Lyon-Marseille) used in the 1920s and 30s, when the popularity of rail soared as the best way to travel across France. 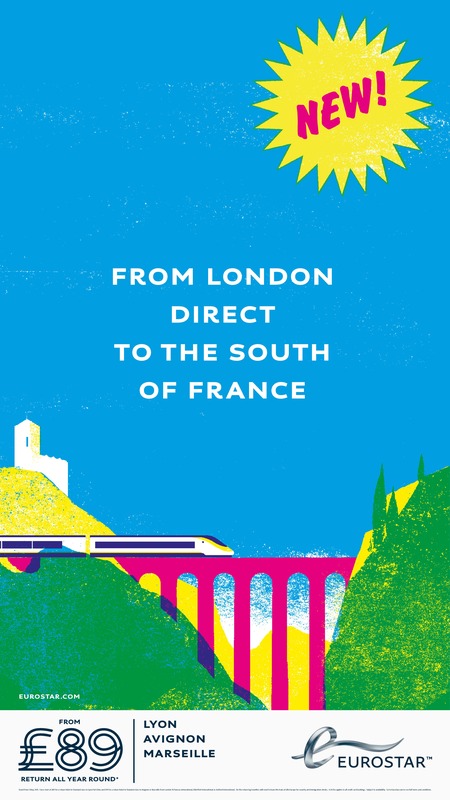 Each image used in the UK campaign has been selected to highlight the glamour of Eurostar’s new range of French destinations, with artwork produced by Blex Bolex. The French illustrator also created imagery for children’s book ‘L’Imagier Des Gens’, awarded the Most Beautiful Book of 2008 at the Leipzig Book Fair. The new Eurostar route offers a seamless journey from the heart of London or Ashford to the centre of Lyon, Avignon and Marseille. Fares start from just £89 return in Standard Class and £189 in Standard Premier, with up to five services a week, depending on the time of year. Activity in France will focus on Lyon , highlighting London as a new destination by train. An outdoor campaign will feature a building wrap in Lyon’s ‘Place Bellecour’ from 2nd March, and a train wrap of the Lyon airport shuttle amongst classic formats from the 17th – 25th March. The copy-led campaign features the creative concept of ‘Lyondres’, to show that the new Eurostar route will bring the two cities together, from city centre to city centre. The campaign has been developed to educate people in the area, who previously would have had to change in Paris before taking a Eurostar to London. For more information or to book Eurostar tickets visit http://www.eurostar.com or call the Eurostar contact centre on 03432 186 186 or +44 (0)1233 617 575 if calling from outside the UK.